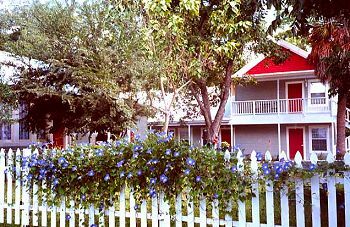 This charming bed and breakfast, originally built in 1913, is nestled among towering pecan trees in the historic district of Smithville, Texas. Each of the five rooms has a private entrance and bath, and is beautifully furnished with antiques and luxurious Egyptian cotton linens. Traditional breakfasts, including meats, fresh fruits, and omelets/quiches are served in the formal dining room of the main house. Two nearby state parks offer golf, hiking/biking, swimming, and fishing. Several championship golf courses are in the vicinity. The Bike Ranch at Rocky Hill (3.5 miles) is a mountain biker's dream. Tourist attractions abound in Austin, the State Capitol, the LBJ Library and Museum, the Bob Bullock Texas State History Museum, and the annual South by Southwest (SXSW) film and music festival (March 8-17, 2002).